* I received a copy of this book to facilitate my review. I was not compensated in any way for publishing this review. 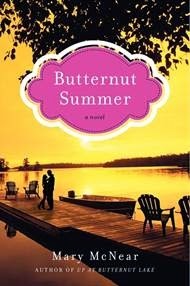 Butternut Summer was the perfect summer read. Not too intense. Not too heavy. Not too flaky (yes, I know, sometimes a flaky beach read is just what you want - other times - not so much). The story slipped back and forth between Daisy - a twenty-something on summer break from college - to her mom, Caroline - a forty-something trying to keep her head above water. And how well I could tell, as Caroline is about my age. So I could totally relate. But I also couldn't. Her daughter was in her 20s. Mine is 7. She's a divorced single mom. I'm a married mom. She runs her family restaurant full time and lives right upstairs. I'm a SAHM/part-time social worker who lives and works in my home. I still enjoyed getting to know these two characters. I also enjoyed meeting Caroline's ex, Daisy's father Jack. It was nice to meet him through both of these women's eyes, and then on his own, as well. That was part of what I truly enjoyed about this book. That we got to see the story and learn about everyone through each character's perspective. That aspect was most clear when we met Will, Daisy's eventual like/love interest. *This is where I would insert the wink! * Getting to know Will from his own words and watching as he shared his connection with Daisy while hearing hers, as well, was something that worked for me. I love those kinds of books, as a rule. So this was no exception. I'll admit that the way the story wrapped up was kind of predictable, but enjoyable nonetheless. So consider ordering your copy of Butternut Summer today. * Thanks to William Morrow for sending me a copy of this book to facilitate my review. I was not compensated in any way and all opinions expressed here are completely my own. I am going to the beach in a couple weeks, and I am ALWAYS looking for a good beach read! I may have to give this one a try! I've been reading a lot of books that have had multiple narrators, and sometimes have gotten confused while reading it. Did you have a similar problem with this book? it sounds like a good read so far. Great review...this sounds like a really interesting read for just about any age group. Thanks for the recommendation. I have an exceptionally long flight tomorrow. This is the perfect recommendation... not too light and not flaky. You're right though, flaky is sometimes good. Sounds like a fun read! Perfect for the beach for sure! This sounds like a great rainy day reading book. This looks like a book that I would enjoy. I will have to add it to my list of books to read soon.